Shortly after I sprouted my wings by starting my flying lessons, Jeff let me know that our airplane would not be available for a lesson during the last week in July. He and his friend Brian would be flying to an air show in Oshkosh for that week. I was surprised that he would give up an entire week of cottaging in the middle of the summer – prime water-skiing season! This must be a very special air show!Jeff assumed that I would not be interested in leaving the cottage for a week in the middle of the short Canadian summer, to go to an air show. Normally, he would be correct, but I needed more information! I learned that, every summer, the airport in Oshkosh, Wisconsin hosts a huge “fly-in” and air show called EAA AirVenture. Over the course of one week, 10,000 airplanes fly into and out of the airport (making it the busiest airport in the world for that one week) and approximately 600,000 people gather to celebrate all things aviation. I became very intrigued and asked lots of questions. Then I surprised Jeff by announcing that I wanted to go along for the flight – not for the airshow, which didn’t really interest me. I would take lots of paperback books and relax by the pool at the hotel. Sorry, but Brian would have to sit in the back seat. “Uhm, the back seat will be filled with camping gear”, Jeff replied. Camping gear?!? This was news! Apparently, Jeff and Brian would not be staying in a hotel at Oshkosh, they would be camping beside the airplane, on the ‘field’ at the airport! But we did not own camping gear! I had not been camping in decades, so this knocked me back a notch. Not to be deterred, I pressed on. With my Canadian Tire discount, we would buy a tent, sleeping bags, a cooler and camp chairs – I supposed we’d be all set. “But with the camping gear, there won’t be room for Brian in the airplane”, Jeff lamented. “Sorry, Brian, maybe next year”, was my less-than-sympathetic response. Brian took it well – actually, his wife was pleased that he would not be abandoning her for a week during the summer. Over the next two weeks we planned for the trip, bought camping gear (including an ‘easy-up’ tent), and packed our bags. On the morning of our departure, we drove to the Lindsay Airport to load the airplane with our gear. It took far longer than we had anticipated. The camping gear was awkwardly shaped and did not fit well into the back seat and baggage compartment of the airplane. And taking the back seat out of the airplane would have required a legal ‘weight and balance’ change that we were not equipped to deal with right then. I was getting frustrated, as I was excited and impatient to get up into the air. We loaded the gear as best we could and we tied it in. By then, we were well past our estimated departure time and when we took off, it was past noon. Finally, we were off on our first big adventure (to ‘AirVenture’!!). This was my first trip in the airplane where we would not be returning home the same day. And it was the first time that I would be joining Jeff on a flight where we would need to stop to get fuel before continuing. And it was my first cross-border flight in a small airplane. Lots of firsts! I had only had three flight lessons before this trip, but it was enough to allow me to be more of a “participant” than just a “passenger”. I marveled as we flew along the Lake Ontario shoreline and then over London, Ontario. When Jeff needed to re-fold maps or look something up, I was able to take over the controls and keep us flying (relatively) straight and level. As we approached the U.S. border, I was intrigued by the interaction between Jeff and the U.S. air traffic controllers. We landed at Port Huron, Michigan, to clear customs and to get fuel. Clearing customs in a private aircraft is different from clearing customs at an airport after disembarking from a large jet with lots of other people. It is more personal and personable. It is truly a one-on-one experience and I felt respected and privileged. Certainly, there is paperwork, but it was fairly quick. Also, the airport was putting on a BBQ lunch for all the Oshkosh-bound fliers. I was beginning to realize that I had joined a ‘club’! I mentioned to one of the fellows eating lunch that I was taking flying lessons and he looked at Jeff with envy. That was my first clue that I was an anomaly – a wife who was interested enough in flying to become more that just a passenger. After a quick hamburger, we took off again. We had two more legs to fly, as we didn’t have enough fuel to make it all the way to Oshkosh in one leg. We landed at Gary, IN (south of Chicago), for fuel, in the late afternoon and realized that we would not be able to get to Oshkosh before dark. We decided to stay overnight in Gary. Have you ever been to Gary? No offense to Gary residents, but – well folks, skip it! At the airport, they advised us that there was really only one place that they would recommend to stay overnight – the hotel at the casino. We got a taxi, went to the casino and checked in and then decided to go exploring. Except that there was nowhere to explore! The casino was self contained for a reason – it was the safest place in town. Another problem was that there was no restaurant and we were starving! What kind of casino doesn’t have a restaurant? We ended up eating cereal bars that we had packed in our bag. Thinking back, I now realize that it was a good thing that we ended up in a hotel room with nothing to do for a few hours on the night before we were to fly in to Oshkosh (one of the most exciting and rewarding flights that a private pilot ever experiences). It gave us a chance to review the ‘AirVenture Notam’ (Notice to Airmen). This is a 30 page booklet that everyone flying into AirVenture must possess in their airplane. It describes, in detail, the special procedures that are required to ensure safe arrival at Oshkosh during the busiest week of the year. Actually, it gave me a chance to review it, since Jeff had already studied it at length. That night, I read it from cover-to-cover. I learned that all airplanes must converge, following suggested routes, and join the arrival path over a small town called Ripon about 10 nautical miles south west of Oshkosh. We then had to follow each other, spaced at least ½ mile apart, over a railroad track, until we reached the town of Fisk, where there was an Air Traffic Control station. It was a temporary station, set up for Airventure. 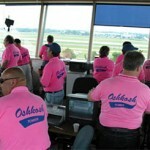 Every year, Air Traffic controllers from all over the U.S. compete for the privilege of volunteering at the event! The controllers at Fisk would identify each airplane by type and colour and provide instructions about what to do next. And instead of responding to the instructions over the radio, we were to acknowledge by rocking our wings! 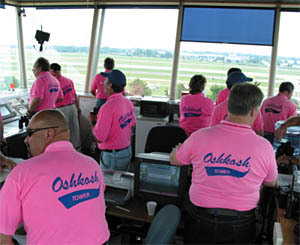 We would then switch to the Oshkosh Tower frequency and follow the railroad track or road, as instructed, to the Oshkosh airport, where we would land on whichever colour dot on the runway we were told to. Yes, a dot! There are so many airplanes flying in over the course of the week, that in order to get them all in, they need to be able to land three airplanes at a time on the runway! There are huge coloured dots painted on the runway, more than 1,000 feet apart and pilots are instructed to land on either the threshold of the runway or on the white, orange or green dots. Then we are to immediately exit the runway onto the grass and follow the flag person to our camping spot. This sounded like fun (and a bit scary). No wonder Jeff was excited! We were up early the next day and departed Gary, IN, for a short hop to Oshkosh. We followed the suggested route and as we approached Ripon, we could see a few other airplanes. We were able to fit ourselves in on the first try and flew along the railroad track to Fisk. As we listened to the airplanes ahead of us receiving their instructions from the controllers at Fisk, I became more and more excited, and the grin on my face got wider and wider. When I saw the airplane in front of us rock his wings, I gave an excited giggle. What I heard next put me over the edge, emotionally: “White high wing – I think you’re Canadian – rock your wings”. We rocked and I wept with excitement! I’m looking forward to reading about your first ground impressions. The rest of the story will relate some anecdotes – and learnings – from our first stay at Airventure. You left me breathless!! What happened? Did you land? Safely? When is the next episode?? Haha, Gladys, you will have to wait for my next story (maybe a week from now) to find out!